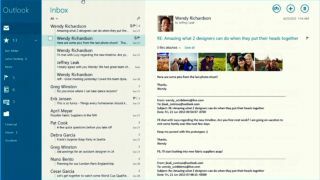 If you install the Windows 8.1 Preview, the Mail app that comes with it is the most recent version of the Windows 8 Mail app, but when the final version of Windows 8.1 is available it will come with a much more powerful app with some handy navigation options and features that take advantage of what Outlook.com can do for mail management. Microsoft showed more details of this during the Microsoft Build conference and program manager Jeremy Epling also mentioned some future features. Although we haven't yet been able to test the new Mail app ourselves, it loaded and ran far more quickly that the current Windows 8 Mail app in the demo we saw. The new Mail app will have a 'power pane' down the left hand side with icons to see your inbox, mail from your favourite contacts, messages you've flagged, mail that's been classified by Outlook.com as newsletters, your contacts and all the folders in your inbox. The Outlook label at the top doesn't mean this is a Windows Store version of the Outlook desktop software; it means this is mail from an Outlook.com account – which means you get some features from Outlook.com, like having newsletters in a separate folder and being able to 'sweep' away all but the latest issue of particular newsletters. You'll also be able to get Google and IMAP email (and Microsoft is working on accessing Google calendars, although Epling couldn't say if that would be in the 8.1 Calendar app or not). You won't be able to see messages from multiple email accounts in the inbox at the same time. For one thing, it would be confusing because only messages to your Outlook.com account get features like sweep and newsletter filing. The Mail app doesn't have rules, but you can use the Outlook.com Move feature to automatically put messages from specific people into a folder. Use the Outlook.com sweep feature to clean up newsletters; you can choose to delete all the messages from a sender, to delete any messages older than ten days from them or to only keep the most recent message from a newsletter. Choose a favourite person from the list in the power pane to see all the messages you've received from them. Click to get the conversation expanded so you can see both sides of the discussion. You can switch quickly between your email folders from the power pane. You can create new folders and subfolders from the app bar, or pin a specific folder to the Start screen. You can also delete all the messages in a folder without having to select them all one by one. If you're using Mail on a large screen with a mouse, you can open the folder slit form the app bar instead of having to mouse all the way over to the side of he screen. New tools in the inbox let you flag or delete a message easily when you hover your mouse over it. You can open the app bar by swiping or right-clicking but when you select a checkbox for any mail message the Mail app switches into selection mode, because you wouldn't select a message unless you wanted to do something with it – and this opens the app bar automatically. You can still use the Search charm when you want to search for other things on your computer but now the Search icon in the Mail app opens a search bar at the top of the inbox. You can choose whether you want to search just the current folder or across your whole inbox.